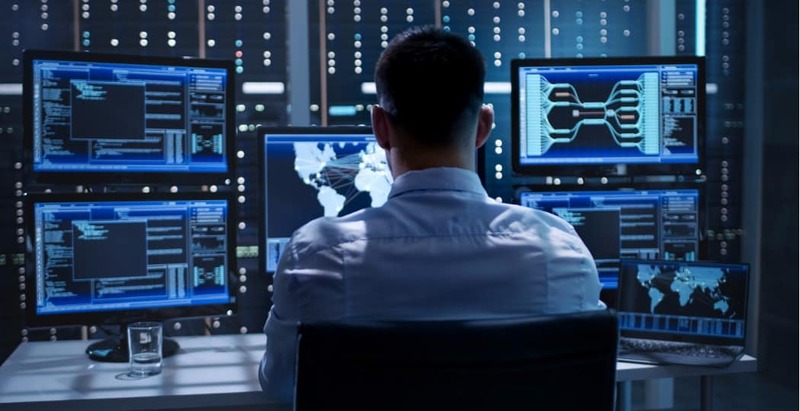 Windows 7 by default runs most applications with least privilege access (non-admin) in an attempt to keep both malicious virus code and inexperienced end users from damaging the system. In most cases, this is a VERY good thing. However, more geeky groovyReaders may need an app to run as an Administrator for various reasons. 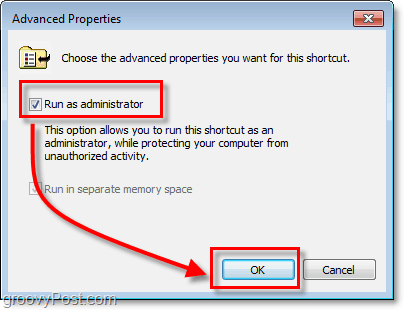 Although running Apps as an Admin can be accomplished using a simple right click, it’s also possible to set an app to ALWAYS run as Administrator thus saving a few clicks here and there! Here, let me show you how! 1. 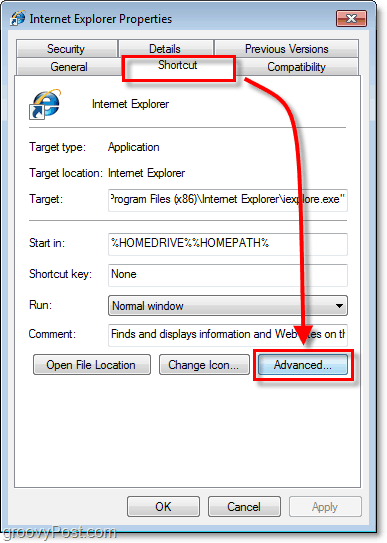 Right-Click the Program Shortcut you would like to run as an administrator. Click Properties from the context menu. 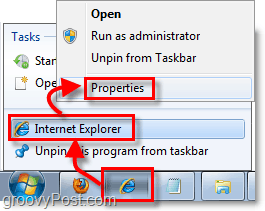 Note: In the case of Shortcuts pinned to the Taskbar you will need to Right-Click the Taskbar icon and then Right-Click the program name from the jump list. 2. Once you are in the Properties menu, Click the Shortcut tab at the top. Then Click the Advanced button. 3. Click the checkbox for Run as administrator, then Click OK to finish. Now your shortcut will automatically run your program in administrator mode without any extra steps or without asking for special permission. The only thing that can get in your way now is the Windows 7 UAC which is simple to adjust. Hi, I am on Windows 7 and have a similiar problem. have to run outlook as an administrator to disable some old addins. I do the above right click and go to short cut>>right click on properties>>click short cut>>click advance, but I CAn’t click run as administrator, it is there, but can’t click it. Found the solution to my previous post, when I right click on the icon>> goto properties>> goto Compatibility (instead of Shortcut)>>select run as administrator. IT WORKED. Thanks all for pointing me in the right direction.. Thanks Bill! I’m in a corporate environment, and the solution provided in the original post did not work for me since the option was grayed out (probably due to group policy). Your solution worked, though, and I haven’t noticed any UAC issues (possibly due to the corporate environment, though). Is ther a way to programmatically make a batch file to always run as admin in Windows7? Perfect! Fast and easy. Thank you! Fail. I’ve done both what the writer recommended AND commenter Bill recommended and still get the UAC prompt. Decent idea, but this is not the same as when you press “shift” and “rightclick” on the icon and select “another user”. I am looking for a solution to start programs with another useraccount. If i do the suggestion mentioned here, it still fails. Anyone? I have a piece of software that just will not run properly under a user. I have given the user full control on the harddrive, yet it fails. When i shift+ rightclick the program and select “localpc\administrator ” it works fine. I am quite desperate to solve this. I have made the user admin, gave him full control over the pc and registry but the program keeps failing. The supplier does not know an answer, of course, so i have to find a way myself again. But Run As Administrator check box is dimmed I can not click it. I have same problem. I have tried every suggestion to run Outlook.exe as admin. Compatibility, run as user .. advanced, run as Admin for ALL users … nothing works. I cannot change my add-ins which are causing many problems. There must be away to fix this without re-installing Office 2007. 3.) go to “compatibility” tab and and select option “Run this program as an administrator”. If the option is not enabled. Then click on button “Change settings for all users” (It might ask for admin authentication), and then option will be enabled.